There's a reason the lines for the Italian bakeries around Hanover St stretch out the doors nightly: the bakeries' pastries, specifically the cannoli, are f--king good. Nobody does stuffed tubes of fried dough better than people in Boston. And no place in Boston does them better than these eight spots in the Hub's cannoli capital: the North End. Reputed to have some of the best cannoli outside of Italy, Maria’s is our top pick for the classic version in the North End. Its filling is thick and smooth with plenty of ricotta, and the golden shells have just the right amount of crunch. 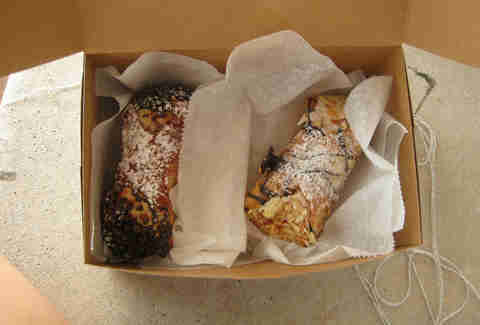 Unfortunately, the shop is tiny and closes early, so you’re best off taking your cannoli to go. They're on the steeper side price-wise, but Taranta’s guava and ricotta mini cannoli -- each coated with a generous helping of pistachio brittle -- are well-worth the Alexander Hamilton. Nowhere else in the North End will you find such an unexpected (and delicious) take on the classic Italian pastry. Modern’s cannoli have more ricotta than your average North End filling, which we personally think is a good thing. They’re thick, crunchy, and an all-around stupendous example of what a cannolo should be. Plus, Modern will even make you a custom cannoli cake! 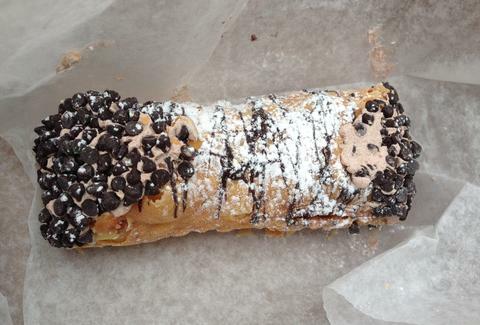 Because cake is good, and cannoli are good, so why not eat both at the SAME TIME? The Sicilian cannoli at Bricco feature candied fruit and raspberry coulis with a huge scoop of vanilla gelato… ‘nuf said. 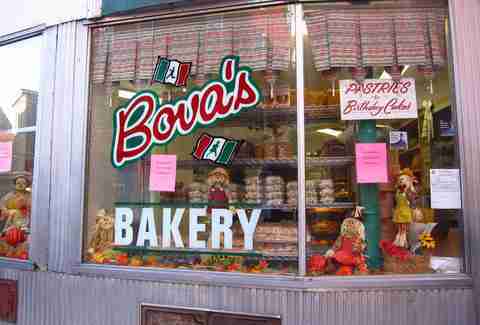 Bova’s main merit is that it’s open 24 hours, so if you need a Nutella cannolo at 4am, it’ll be there for you. 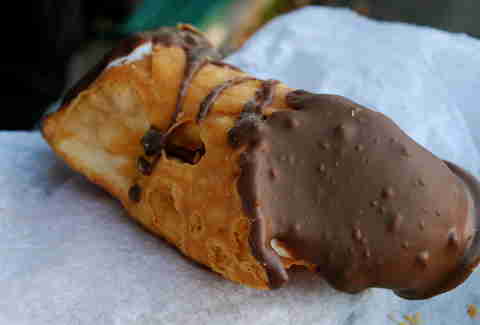 Nutella cannoli, guys. Whenever you damn well please! Pair that with cappuccino cannoli, and you’ll have hazelnut mocha-noli, which is pretty much exactly what you’ll want when Saus closes and you need a chaser for your beer float. For those who like a thinner filling, Paradiso is the way to go. It's also open until 2am every day, which is a huge perk. 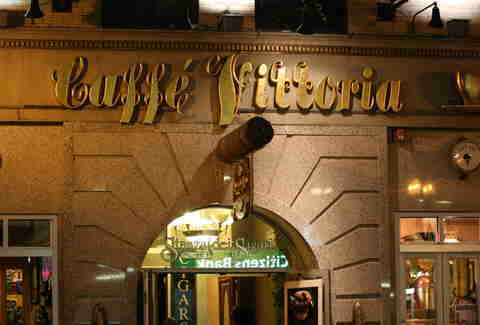 Vittoria was the first Italian café in Boston, and while it’s not our No. 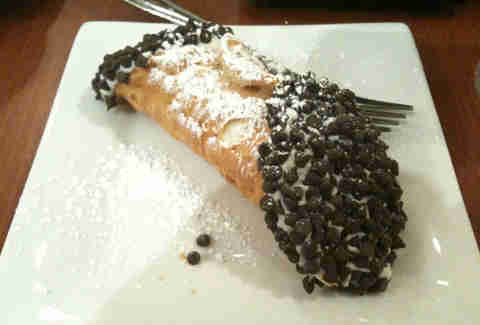 1 cannoli pick, it's better than average and the ambiance is well worth a visit. Snag an espresso or a grappa to complement your pastry, and you’ll be happy hanging out all night. 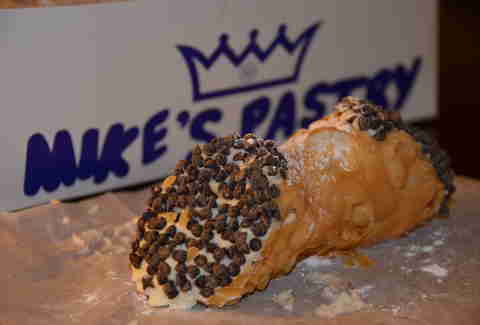 Mike’s cannoli are crispy, thick, and on the sweeter side, which is probably why they’re so universally popular. The North End institution offers a bazillion filling options, including Italian flavors like amaretto and limoncello, as well as novelty flavors like Oreo and peanut butter. It’s a great place to go with a crowd that doesn’t mind battling tourists for a spot at the counter.